When Giulianna was born she was so sweet and beautiful. Giulianna did all the normal things a new born did such as eat and sleep. However, Giulianna would only sleep when I would hold her and she would never sleep on her back. She cried a lot over the first weeks and months. She would cry. For hours if we let her. So I gave in allowed her to sleep on my chest, on her belly while I sat up on the couch. This went on for almost 8 months until she finally just slept in her crib. When Giulianna was almost 3 months old I took her to my place of work to show her off. Little did I know how it was going to affect her. All of my friends gathered around to see her when she started crying uncontrollably. I blamed it on her teething and told them I had to go. During the first 8 months I found that she would cry when I would lie her on her back to change her diaper or if I changed her in a public bathroom. People would give me looks wondering what was wrong with my child. Giulianna would never sleep without a white noise machine. It seemed like she heard every noise in the house and would not sleep. Because of this I had to make sure that when I went back to work, her babysitter and my mother had to have the white noise machine. At about 5 months old I noticed that any sound would startle her. I was a new mother and didn't know any different. I just thought that she was a baby that slept very lightly. Over the next few months I noticed that Giulianna was very clingy and would cry if anyone except my mother or myself held her. She would cry uncontrollably in social situations. Giulianna walked at 13 months old and really didn't talk much at all until she was 10 months old. I remember going to a function in honor of my friend who passed away and there were hundreds of people, kids & animals there. Giulianna began to cry uncontrollably and so loudly that it concerned me. I could not console her so I excused myself from the event and walked with Giulianna in the stroller back to my car. The further we got away from the crowd of people the less Giulianna cried. When we got to the car I put her in her car seat she was quiet and began to smile and talk. She was 15 months old and this was the day I realized that something was terribly wrong and I had to find out what it was. I sat in the front seat of my car and cried my eyes out. I was exhausted from what had just happened today and the months prior. I turned and looked back at her sweet smiling face and her blue eyes still red from crying. She melted my heart. I needed to help her. The next week I took Giulianna to see the pediatrician, Dr. Verdi . I explained all of the things that have been going on and Dr. Verdi suggested that Giulianna may be suffering from Sensory Processing Disorder. I already knew what the disorder was from work and having a child on my caseload that had it. All of the sudden everything clicked. I was POSITIVE that is what Giulianna had. Dr. Verdi gave me a referral for Children's Specialized Hospital for Giulianna to have an autism screening. That day scheduled an appointment which was 3 months away. The day finally arrived for me to take Giulianna to CSH for her evaluation/screening. My mother went with us for support and to educate herself. We walked into the waiting area and Giulianna clammed up. Clinging to my mother while I checked us in. It was noisy with other children similar to her playing and crying and yelling. We went into an office with a Nurse Practitioner who was completing her evaluation. I answered so many questions that my head spun. Then it was Giulianna's turn to work with the nurse. I was told ahead of time that I could not prompt her on any of the answers and I didn't. Giulianna did well. evaluated for school based preschool services for special needs children as Giulianna would be turning 3 soon and aging out of Early Intervention. So I called the school and set up with a meeting for September. Then Giulianna had her evaluations by the team at the school and was accepted into the preschool program. 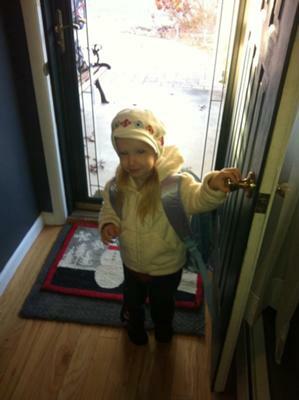 So on November 17th Giulianna started school. It was so hard to hand her off so quickly. I did this for the first 2 weeks of school and then was encouraged to let her go on the bus. The first day the bus came I wasn't sure if she was going to freak out and cry. To my complete and utter surprise, my little girl got on the bus, looking a little scared, but never ever cried on the bus to this day. She loves the bus. She loves school. She is what the teacher describes as "painfully shy". Though she goes to school and seems to interact with only one child.She is making progress. We can go out to restaurants, the park and be around other children without her stressing. She still does not completely interact with other children. She does a lot of observing them. For so long she has been fearful of other children and would not sit at a table with them to eat breakfast without crying. Now she sits with them and does not cry. It has always been so painful for me to watch her standing on the sidelines instead of playing with her cousins and friends. But I realize that she is doing things in her own time. Everyday noises still scare her. She can hear the garbage truck 10 minutes before it enters my neighborhood. She covers her ears when the truck comes by and says "hi garbage truck". She loves fireworks, parades, music etc. She despises unexpected noises that she seems to shake off now instead of cry. Every so often she will cry but it has been a long time. We have our very good days and out not so good days. She is learning that she can tell someone what scares her or cover her ears if it gets too loud or too much. She talks 10,000 words a minute and is one of the smartest kids I know. Funny how she won't speak a word at school though. That's what her teacher means by "Painfully shy". She is making slow and steady progress. She never liked to get her hands dirty or wet and now she gets them messy and loves to wash them. The change of seasons is a a battle in the beginning. She struggles with the changes from Long pants and sleeves to shorts and short sleeves. Also from socks to no socks. Eventually she adjusts but it is a battle. She whines that her pull up bothers her. It is a lot of work all of the time but is getting better. She verbalizes her frustrations and has less tantrums. She has come a long way. Her hearing is oversensitive and her eyes are very sensitive to the sun. When we drop something on a hard floor we hear it fall and she hears it like it's thunder. When we See the bright sun, my daughter sees a bright, burning ball. And with all of this she clams up. That's why she is painfully shy at school. When she gets home she talks a mile a minute. She loves the park but gets scared on the swing. She goes on the big girl swing and dislikes the baby swing. If she swings too high she will start to get nervous and look like she will cry. So we swing slow. she runs across the park past the other children which does not make her flinch. That's progress. She tells me that shes wet or pooped her pull up but still doesn't tell me before. So potty training will be a challenge. I get tired, Frustrated and mad. Though I will continue to pursue anything that will help her cope. Our days are very routine because that's what she thrives on. We do things the same way everyday. If we go off of that routine she will be off a little too. All I want is for her to be able to play with other children and not fear anything. I want her to be able to go out in the sun and not try to cover her eyes because the sun is burning her eyes. I want her to wear sunglasses but they bother her. I will continue to protect her as well. I will limit her to certain social situations because it can be too much stress and she will be miserable. Her anxiety is less because of her teacher and school. It is still there. I want to wipe her anxiety away. I know only she can achieve that for herself in due time. I want her to be happy and free of all of the anxieties of SPD. I want to spread awareness for her and all the children like her suffering from it. I want to support all of the moms who struggle, cry and push through to the next like I do. That is my "outlet". I just felt the need to share my experience you. I want people to understand when they look at my child she is not throwing a tantrum, she has a disorder that she can not control. The only way is for all of us to spread the word. I am sure I could go on with more stories about my Giuls but I think you all get the point. So nice to hear another story so similar to mine! Thank you for sharing! I just want to tell you, Don't Give up on the potty training! My little girl, who is now 5, had many similar experiences. However, she does not talk and communicates with signs and pictures. Daycare had attempted potty training at age 2 1/2! I was no ready, nor was she! So they tried the following summer, again, not ready! I started last July, fully committed! I exhausted myself and we literally sat in the bathroom for hours. I never thought it would happen. After 3 weeks of intense training, she started to get it! She has not worn a pull up since last August!And now she is completely using the potty on her own!! It's amazing! So just tell yourself you are not giving up, and it will happen!!! Good luck! Hi i shed a tear reading about your lovely girl. I have a son now 8yrs old, James spoke sentences from the minute he could talk, he always cried at loud sudden noises, didnt like being upside down, looked uncomfortable when he ran, he knew more of my neighbours than we did. He started school at 4yrs and not 5yrs like most. He had a little bother getting dressed and undressed, his teacher pointed out that he didnt like to waite his turn, and spoke out in class. He also at age 4yrs prefered his own company. Teacher thought she would leave things for afew months, i said no if their was a problem i would like it dealt with. In Scotland we have the national health service, our national insurance taken from our wages each month pays for everyone to be seen when they need to be. We still have private insurances if you wish to be seen sooner or appointment to suit you rather than them. It just happens that an occupational therapist was going to be in James class to visit another child, and spotted james trying to change for P.E. She asked for james to be accessed. We where seen in a couple of weeks where proprioception reduced was diagnosed. You would call it SPD. A ten min excersice programe was set up and boy what a difference. I asked for the teacher to inform james when the school bell was going to ring before it did so. Instead of lining up with the rest of his class just any old where, his job was to be at the back of the line , making the excuse it was his job to keep everyone in a straight line. This stopped children touching him unexpectedly, and saved him from jumping. Thank you for sharing your story with us. Your daughter has come a long way indeed. I can see she will be okay because she has you for a mom. Its different in the Philippines. Therapies and assessments are expensive but we have no choice. We cope with the cost and hope for the best. Good luck. Hope we can read more of your daughter's progress so we feel encouraged too.